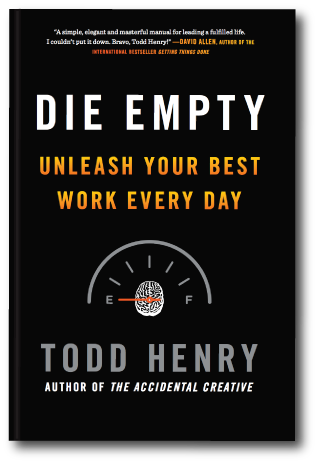 One of the great things that Todd Henry points to in his inspiring book Die Empty is the focus on work. His view, and I agree, is that working to retire and lay on a beach is not the point of life. Instead, Die Empty implies working on things that matter to you. We previously wrote about Die Empty here. Mapping – the planning, plotting and scheming of your objectives, actions and priorities. Making – doing the work. It’s making the calls, writing the words and executing the tasks you defined in your mapping. Meshing – this is the ‘work between the work’. It’s what you to become more effective. For instance, the books you read, the network you build, the systems you create. The three kinds of work then prompts four types of workers. Developer: This is someone who is able to work effectively across all three modes of work: mapping plus making plus meshing. For many of us, we’re strong on perhaps two of the three types of work and not so effective on the third. Driver = Mapping + Making – Meshing. They focus totally on results and actions. And, they don’t take the time to develop their skills to tackle new challenges. Drifter = Making + Meshing – Mapping. Whilst good at making and growing their skills they fail to plan effectively and often spend time working on the wrong things. My contribution: Whilst Todd describes the model in words in the book, the design thinker in me couldn’t help but create the visuals. I’m surprised they weren’t in the book! Which one of these is you? Are you a developer, driver, drifter or dreamer? Can you also see what you need to add to bolster your success? TIP: A powerful and simple model like this provides context. And, once you see a new context it creates fresh opportunities to act in new ways.